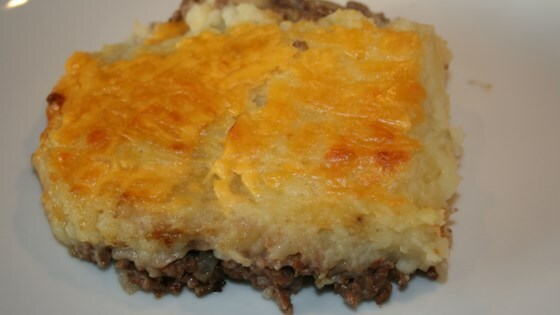 "Ground beef cottage pie with sherry and a fluffy mashed potato and cheese topping. I like to serve it with honey carrots and buttered sweet corn on the side. Can be made ahead or frozen ready for another time. [Originally submitted to Allrecipes.co.uk]"
Place potatoes into a large pot and cover with salted water; bring to a boil. Reduce heat to medium-low and simmer until tender, about 20 minutes. Drain and mash with milk and butter. Season with salt and pepper. Heat oil in a large skillet over medium heat. Add onion; saute until translucent. Add ground beef; cook, breaking up lumps with a wooden spoon, until browned, 5 to 7 minutes. Add sherry; bring to a boil. Reduce heat to low. Season the beef mixture with salt and pepper, and stir in Worcestershire sauce. Sprinkle in flour and mix well until mixture is thick and clings together, 1 to 2 minutes more. Pour beef mixture into the bottom of a casserole dish. Spread mashed potatoes evenly across the top. Season with salt and pepper. Scatter 1/2 cup plus 1/3 cup Parmesan cheese on top. Press a fork into the edges of the casserole to make a pattern. Bake, uncovered, in the preheated oven until piping hot and cheese is melted down, about 30 minutes. Use your choice of grated cheese. Tastes best made the day before if possible. If freezing, make as above and chill in the fridge. Cover with a layer of aluminum foil and a layer of plastic wrap (ensure your casserole dish or tin is freezable). Defrost completely before reheating. I tend to cook when it has been frozen and defrosted with the foil still on (remove plastic wrap) for 20 minutes and the remaining 10 minutes uncovered.